Eye spy with my little eye.... 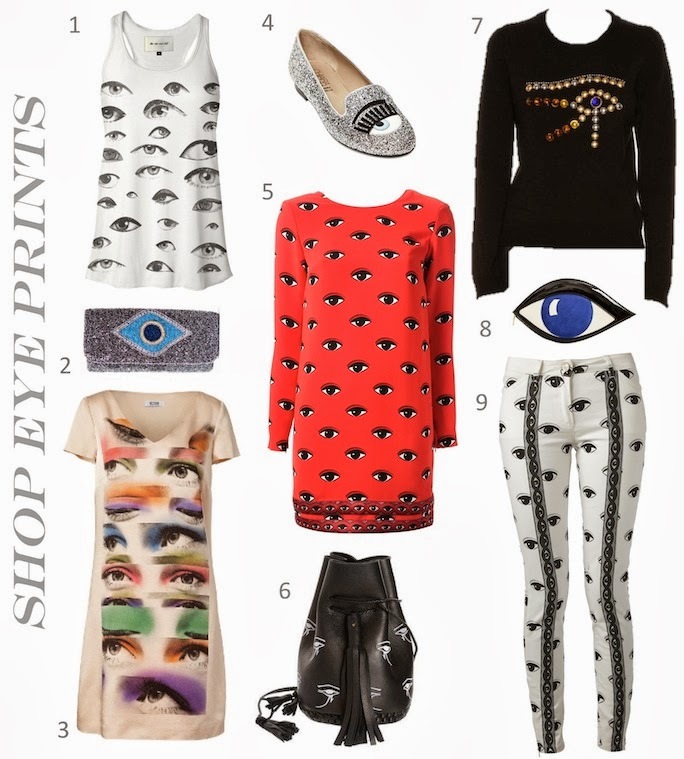 I'll admit, at first I thought eye pattern clothing was kinda creepy, but it's growing on me! Kenzo sent eye patterns down their Fall 2013 runway and big eyes have made their way to the streets and into the stores. Recently, the Spring 2014 fashion show goers gave off some seriously fab style vibes in eyeball patterns (more often than not wearing Kenzo). 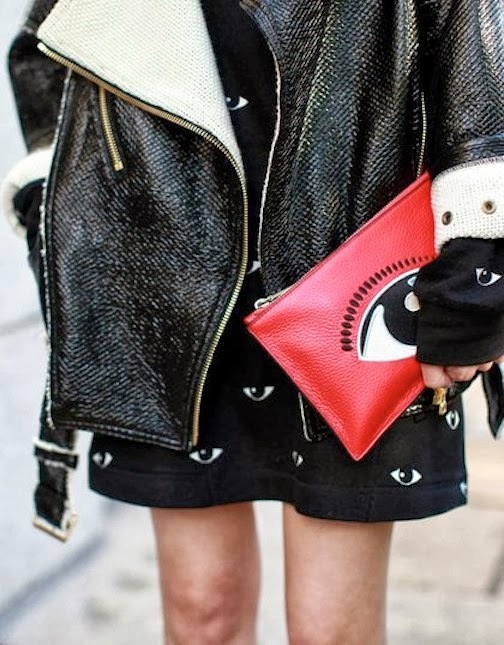 Evil eyes are have been traditionally worn as jewelry to ward off evil spirits, but the motif makes a bold statement when printed or embroidered on clothing or accessories. 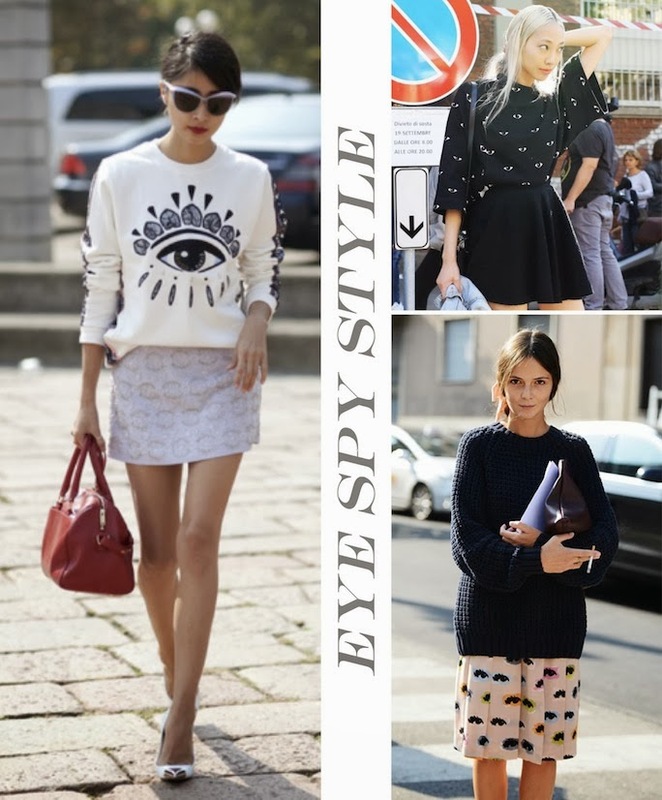 A bit more quirky than bewitching, current eye prints are a fun alternative to classic florals or plaids. Personally, I'm craving these fun eye embellished loafers from Chiara Ferragni, but I also wouldn't mind a statement sweatshirt to keep all eyes on me. What do you think, are eye patterns cool or cooky? I never thought I'd say this, but I LOVE THESE! Usually I'd find this creepy, but something about the print is so fun and playful to me. I want that red dress! Those glitter loafers are too cute! Love. Love every single one of your picks. Every single one. Such an interesting trend!! I have been hooked on animal head prints, and actually hadn't notice the pattern yet. I have so much evil eye jewelry, so clothing is the next logical step! Chiara's shoe line is seriously so adorable and playful! I'm kind of digging this trend too, Chelsea! How funny I did a post like this a few weeks ago! I love the trend...I think many are not into it....but I love it...and would totally wear it. interesting similarity with this young artist and Kenzo designs!